[unpad.ac.id, 11/11/2018] Students of the Faculty of Communication Sciences, Unpad won an achievement at the top of the “Communication in Action” (CIA) event held by the UB Communication Department at Gajah Mada Hotel, Malang, Sunday (4 / 11). In the annual communication competition held since September, Unpad Fikom students won two awards from two branches of the competition. Overall, the competition consisted of four branches. 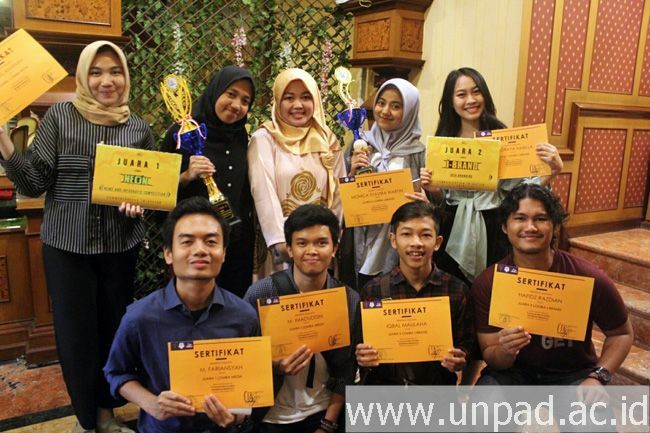 The first award was won by five students of the Journalistic Study Program, namely Nurul Amanah, Elza Triani, Mohammad Fariansyah, and Muhammad Imaduddin. The team named “Fariansyah and Team” won first place in the News and Infographic Competition (Neon) branch. Furthermore, the second award was won by three Communication Management Study students, namely Monica Syafira Watrin, Iqbal Maulana, and Sri Soraya Nadilla. Three students who are members of the “Candokaiyo” team won 2nd place in the “Idea Branding” competition branch (Ibrand).